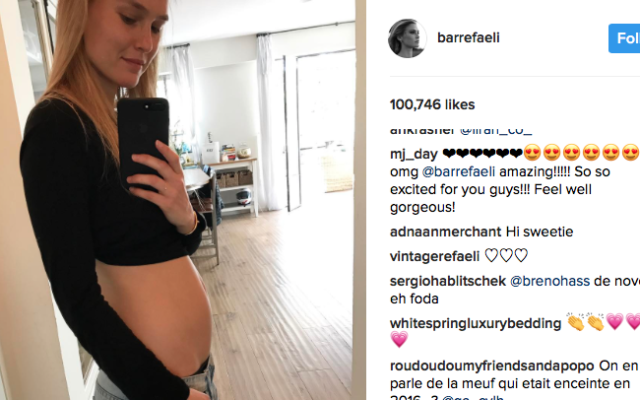 Israeli supermodel Bar Refaeli is pregnant with her second child. “Something’s cooking,” she wrote in a post on Instagram alongside a photo of her taking a selfie of her bare midriff, which shows a small baby bump. Refaeli gave birth to a baby girl, Liv, last August. She married Israeli businessman Adi Ezra in September 2015. Refaeli is considered Israel’s leading female model and was featured on the cover of the 2009 Sports Illustrated swimsuit issue. She is a former girlfriend of the Hollywood film star Leonardo DiCaprio and in 2012 was voted No. 1 on Maxim magazine’s Hot 100 list.